This is called The Noah Ghan. The pattern was originally published in Crochet! May 2008. I changed it slightly adding a few animals. I used Red Heart Soft Yarn. It is for Danae's new baby granddaughter, Cindy. So this is what I made my SSP on the swap at Snarky. 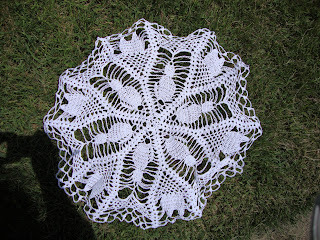 This was my first successful doily and is called "Pretty Kitties Doily" by Judy Jagel. 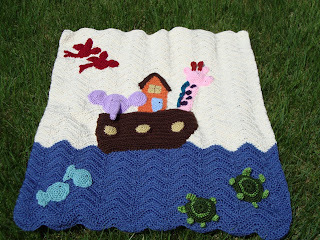 It was in Annie's Favorite Crochet, August 2005. I had attempted doilies in the past and it was never successful, but now I actually might make a few more... 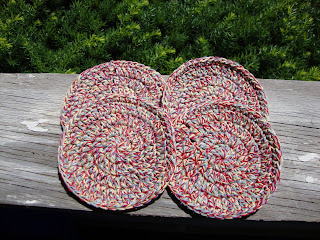 I also made her some placemats and coasters out of Bernat Handicrafter Cotton Country. 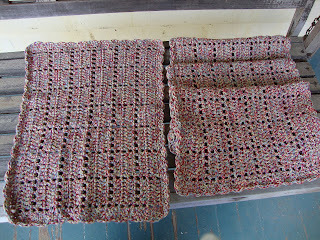 The placemats were from Easy Stitch Placemats. I did change the border as it didn't look right with this yarn. The coasters I kinda winged. She seemed very happy with her gifts. There were several other things included in the package. I have not yet received my package from my swap partner. 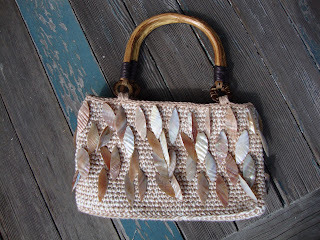 This is a bag I finished for Keira, my teaching partner. She designed it. I always seem to be making her something over the summer, for the summer. Last year it was the bathing suit! It went pretty fast, except the shells. Those hurt to sew on! So I did them for two days. 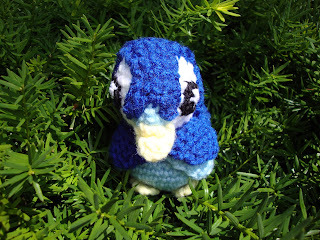 This is a Piplup from Pokemon. 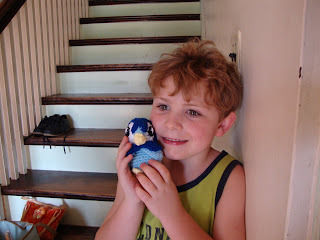 I had promised Aiden I would make one, however I couldn't find a pattern. So I got a picture and created him from the picture. He came out pretty good, but I did get frustrated with it for quite awhile. I forgot to put the two little white circles on his belly, but I will do it next time I go over their house.